I hope you are doing well. It’s a very good time going on in HYIP industry. Many promising programs are launching regularly and I’ve found most of those are doing well. Today I’ll write about Richmond Berks which was started on 24th of November 2016 and added to AlexNews on 2nd of February 2017. Although this program was started 80 days ago but they have started their promotional activities from last 10 days. The result from last 10 days wasn’t outstanding but this program has everything to become popular in HYIP industry. 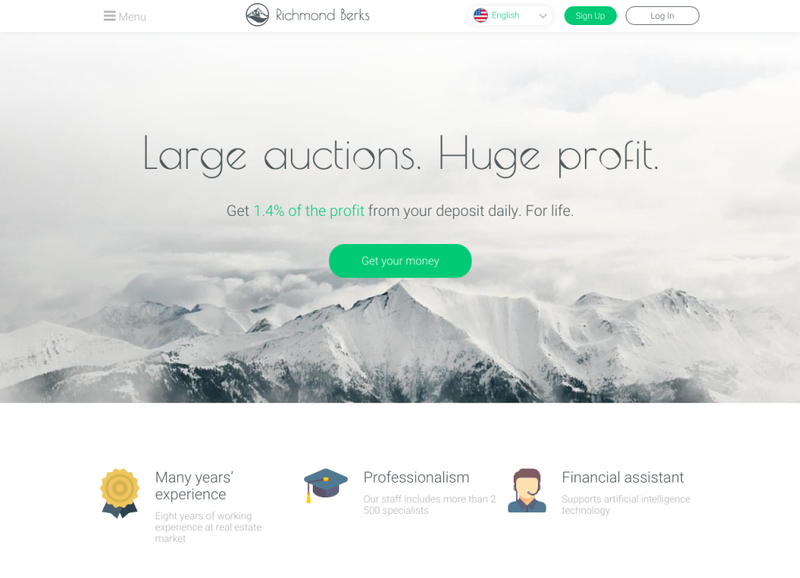 Richmond Berks has come with a different type of investment program. They are offering to buy (and invest via) a virtual currency called RBD – Richmond Berks Dollar. Generally you have to buy RBD which has the same value as dollar (1 RBD = 1 Dollar) and the value will not change in future. You have to invest in RBD and your profit will also count in RBD. When you’ll sell your earned (earned from daily interest) RBD you’ll receive dollars to your payment processor. However, these RBD has no other contribution is this program and don’t have a practical value. We have seen some other HYIPs which were offering to buy so called virtual currencies (or crypto-currencies) and the rate of those virtual currencies was increasing daily. Investors were making profit from those growing rates. In Richmond Berks, the rate of RBD will not change and they’ll provide the interests from their investment plan. By the way, the presentation of Richmond Berks is very impressive. They have a good looking website which is very different than other HYIPs and a lot of menu containing something new and useful information on every of those. There are a lot of video reviews also and a live chat option with automated messages. Richmond Berks has only one simple investment plan – 1.4% daily for lifetime, 0.7% on Saturday and Sunday. Principal can be withdraw anytime but have to pay 50% of principal as a fine. It will take around 42 days to earn 50% of your capital (if you invest on Sunday). So, if you withdraw your capital after 42 days then you’ll have no earning from your investment. According to this calculation we can tell that the real profit will be started from 43th days of investment. However, this is not a deal-breaking term, there are a lot of long term program where real profit starts after more than 50 days. You’ll earn 8.4% per week from this plan and 100% of capital will be earned after 12 weeks. There is no condition that you have to withdraw your principal but if you withdraw your principal after 12 weeks then you’ll have around 50% net profit from your investment in Richmond Berks. It may not look so attractive at a glance but the profit ratio will be increased day by day. For example – if you withdraw your profit after 24 week then you’ll have 150% net profit from your investment which is 3X more in double time. In a word, this plan is suitable for a long term investment. By the way, they have some other offers to earn more. There is a “Promo Code” and by using that promo code investors will get 3% bonus on their investments. And they are also offering bonuses (up to $110) for completing some steps -$10 for sign up, $50 for sharing on social media, $15 for completing profile, $10 for installing their mobile application and $10 for and $15 for verifying mobile number. There is also opportunity to earning $1 per affiliate signups. However, this bonuses are not available for withdraw instantly but you’ll get 0.05% profit daily from those bonuses. 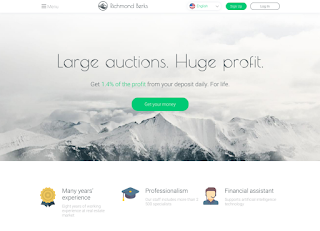 By the way, Richmond Berks is providing 10% referral commissions which are available to withdraw instantly. Well, Richmond Berks has presented their program very professionally. They have spent a lot to build their program and also spent enough for the promotional activities. The bonus system will also help on their program’s promotion. The admin supposed to be serious about his project and tried his best to make a compact project. Investment plan and the promotional strategies are great and now it’s time to see the reaction of investors. I think Richmond Berks will run for a long time if they get proper support from investors, but please do not invest more than you afford to lose.